The CARE Food Pantry is an all-volunteer community compassionate outreach program dedicated to assisting those in financial need with food assistance to supplement their food shopping. The pantry offers a designated list of food items each month to individuals or families in need. We gladly accept assistance from public and private aid agencies as well as from members of New Sharon and surrounding community local churches, friends, and businesses in the community. We work in accordance with federal, state and local guidelines for food pantries. The CARE Food Pantry is open for grocery distribution on the fourth Thursday of each month from 10am-11am and 6pm-7pm. We are located at 101 N. Main in New Sharon. Our volunteers work to ensure that food is readily available for people to come and pick up. In addition to distributing food, we also provide information to our recipients about area resources and assistance programs to assist them in achieving self-sufficiency. The CARE Food Pantry is available to individuals who reside within the 50207 zip code area. 1. A driver license with photo I.D. or an appropriate State of Iowa issued I.D. 2. A local utility bill showing current physical address I.D. (photo and utility bill) must be presented each time in order to receive food distribution. 4. Each person and/or family unit will provide their name, address, the number of people residing in their household, and their signature. By providing their signature, the recipients are verifying that they are the person designated by their I.D. and representative of the family unit receiving assistance. The CARE Food Pantry is funded and serviced through the generosity of the area New Sharon churches, individual donors, local civic organizations, local community clubs, local ministerial association, and the Iowa Food Bank. 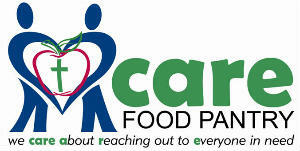 The CARE Food Pantry is a member of the Iowa Food Bank and receives yearly facility inspections from the same. The CARE food pantry has adequate shelving for food items, paper products, and also frozen food storage for meat. The support and willingness of the New Sharon community has made a difference to keep the food pantry open and available to all in need. The New Sharon community wholeheartedly supports the CARE Food Pantry and the benefits it provides for those in need of food assistance. The CARE Food Pantry does not and shall not discriminate on the basis of race, color, religion (creed), gender, gender expression, age, national origin (ancestry), disability, marital status, sexual orientation, or military status, in any of its activities or operations.